Sketchy is a living doodle. He is a prankster and a vandalizer, with the main goal of making his creator Dan's life a living hell. Living in Dan's imagination has become increasingly boring as of late, so Sketchy demands Dan send him to VOID City to participate in the 2010 Invitational. Sketchy is here to win, to build a mountain out of his fallen enemies and sit on his throne as King. Sketchy is obnoxious, loud mouthed, and sarcastic. He is a walking parody of pop culture and doesn't follow rules very well. Physically he is small and weak, but therefore agile. Against a larger foe, he will rely on his speed and wit to confound them. He will use his big mouth to pump himself up and try to psyche out his opponent, but words won't crack skulls. That's what his pencil is for. Sketchy's signature ability is his connection with the Paper World. He can use any paper source as a "portal" into this realm. 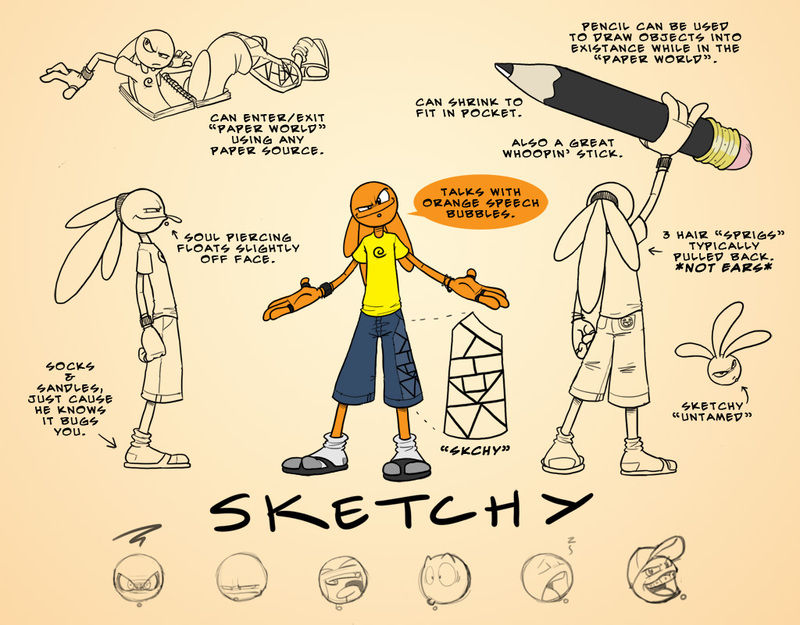 While this trick is used mainly for speedy travel, Sketchy can draw anything into existence inside of the Paper World. But he can only pull out into the physical world what will fit through his exit. Pulling his opponent in with him would be tricky, but not impossible.